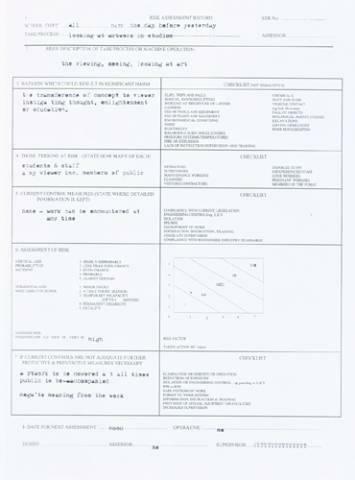 The period between being offered a place on an MA course and its final commencement creates a series of problematical questions within personal practice and lifestyle. The anxiety, excitement and seemingly never-ending waiting reflects changes in the discourse and approach to making work. Having completely over-loaded myself with heavyweight research / reading and with a week to go before enrollment on the MA, I have finally got round to instigating some new work! As an antidote to my current pre-occupation with serious philisophical utterings, I have decided to look back at more humerous aspects of my work. In particular, a line of works that disable the function of the commodity or everyday routine and turn them into farce. As such, and thinking of that old saying … "about as much good as a chocolate fireguard" … I have decided to start constructing a wax ironing board. 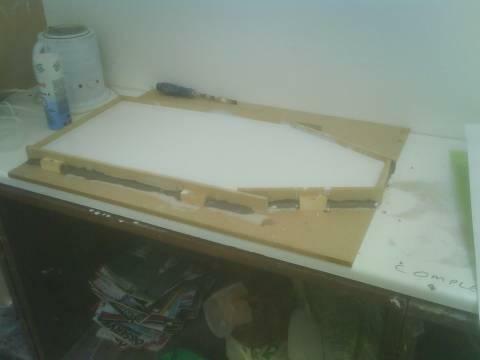 So far, I have been preparing the mould using RTV silicone, which will hold the wax in shape. The piece will only be of small size, like the table top ironing board available from IKEA, in fact, I will purchase and use the base of the IKEA design (then cast it into the wax 'top'). 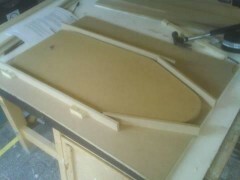 I am hoping it will look aesthetically appealing, whilst ultimately being useless. A perfect excuse to get out of another of life's chores! An 'ironing' perfomance will be filmed, depicting its final destruction (I'm undecided as to whether I or a friend will actually carry out the performance). It will be interesting to see the results, the ruined clothes will be of great interest as sculptural bi-products. It seems reasonable to me that an everyday technique or action such as ironing, should hold it's own against more traditional productive actions as drawing, painting etc. I have recently visited the MA show at Wimbledon where I am going to start (in the sculpture area) in a few weeks. Their end of year show incorporates all specialisms (sculpture, drawing, VLP etc..) and so I was looking forward to seeing the diversity … whilst also hoping that some of my nerves about commencing would be eased ! As an anxious type of person in the first place, I thought that by seeing the show I would feel happier about my ability in relation to those currently completing the course. The work was definately varied across media and 'specialist boundaries' … work that fluxed between performance, video and sculpture was particuarly interesting. In this resepct, standing amongst the plethora of final works, where each person had been able to define an indvidual identity within their work, made me feel at ease. It is this 'crossing' and exploration (though some at the show were more ambitious than others) that I enjoy in my own practice. At least I felt I had made the right choice of college! After leaving the show i felt quite positive, but it wasnt long before the anxiety returned! If I am not so worried about placing my work in the context of the institution, then why do I still feel anxious ? There is a level of 'normality' here i guess, in that, for anyone, a new situation brings about unsettling feelings. Despite being aware of this, it doesn't stop me from thinking … 'i just want to get that first critique/tutorial/presentation over with' !!! Confidence is key for anybody, particuarly artists, where it provides a driving force behind creativity i.e. not being frightened to subject yourself to the 'outside' or to taking on / challenging ideas. Whilst at the moment this situation makes me feel un-confident, I know that in 12 months time it will hopefully be a different story! I have been continuing to try and integrate my use of text and writing (as refelctive critique) into my work. At the same time, my research, as I become close to the start of my MA, has brought me to the confusing world of postmodern theory! Postmodernism describes the deconstruction of language and signs, where text becomes an object of play. The meaning and dissemination of language becomes pluralistic, opening up unlimited metaphors and narratives for the reader (Foucault and Barthes “the death of the author“). 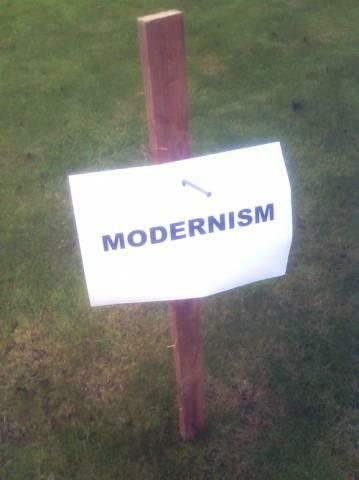 In a postmodern gesture, one that has its essential connotations of irony, I took the word “postmodernism” into sculptural (and literal) signage. It is rhetorical play, a sign of a sign. Though “the apparently literal is also really metaphorical” (Christopher Butler) within postmodernism and so here those old grand-narratives of religion and death (of modernism?) deliminate from the work’s formal aesthetic, that is, of “the cross“. I may reinforce this concept with the use of a wooden in-scripted sign and would like to take the work into the gallery context where these historical narratives intensify. The depiction of “nailing modernism to the post” would be the dream of many postmodernistic / deconstructive theologians. So does this form of work make me a postmodern artist? If the artist contains a “self-conscious reflexivity, whose symptom was a recourse to metalanguages” (Christopher Butler) then I certainly am practicing under the guise of a postmodernist philosophy. In some way I already accept Jean-Francois Lyotard’s description of the end of meta-narratives and their dictation upon art and culture within contemporary social bonds. For me “to be at peace with one’s situation that is not based on disguised absolutism” (Thomas McEvilley) can be a positive place to be. To take postmodernism theory to its extremes we are left with a severely fragmented art, pervaded with doubt. Scepticism is a useful methodology that has fitted well into the artists tool-kit but surely it is time to use this tool to guide the future of culture, than continually tear down the past. Maybe the work discussed really wants to lay postmodernism to rest. Art and Theory. Theory of Art. Art in Theory. Theory on Art. All the reading I have been doing of late has started to have a confusing affect. As a practicing artist, the notion of theory seems a way of validating my activities. A back up, a reasoning … a rational explanation to my seemingly irrational actions. I am indeed interested, like many artists, in philosophy, anthropology, semiology and the many other forms of social science and cultural discourse. I have just finished reading Jean-Francois Lyotard’s "The Postmodern Condition : A Report on Knowledge" and now I am on the search for the next book that might be of relevance. But, even amongst the plethora of art and theory publications (perhaps this in some way exacerbates the problem! ), I can’t seem to find THAT book. A text that would summarise my practice in a neat and concise fashion. To some extent I don’t really want to read a book that helps describe exactly what I am trying to achieve? If my thoughts and work could be summed up in 200 pages, I would be somewhat disappointed! Sometimes, it just feels like I need to justify my practice and feel part of a sensus communis (I expect Freud would have much to say on this!). With the death of meta-narratives (or grand narratives) as described by Lyotard, each artist’s work falls into a pluralistic art world where every practice deserves individual attention, and hence a unique publication. I would be wary of advocating self-promotion in the form of writing a book about my own work, what is known as “vanity publishing” in the sphere of poetry. It is interesting though that as artists we all form the traditional portfolio, a visual version, so how close can this form cross with its textual version…the book? Though I am finding my practice static, in terms of what I consciously consider to be “making work”, I am finding other avenues of expression. This blog for example, started due to a feeling of stasis, could represent a development. Could it constitute a work on its own? It is certainly an expression, it is temporal, acting as a documentation of thoughts and struggles. These are all facets that echo a type of artistic production. If “… gestures have a quality of blundering, indicating an imperfect consciousness” (Brian O’Doherty, Inside the White Cube) then this form of writing, its meandering themes and exploration is a gesture. O’Doherty is writing in relation to the gallery being used as a form in itself, where the gesture is reactionary to what the gallery represents (its formal system). The gallery as context becomes the gallery as content. In the same way can this blog play role reversal? At present this remains unclear to me. I recognise this writing as a release of sometimes in-coherent (or perhaps incomplete) thoughts and am still considering the potential within this. Writing has always been an important form to me, more so than drawing even. I have decided to try and resolve some of my other writings into more structured forms. I have been working as a technician in an art college and have noticed how risk assessments (and other written forms that require completion and authorisation before any artistic action) often act as constrictions rather than enablers. As a gestural reaction I decided to start writing risk assessments of even the most mundane of actions, the use of pencils, sitting in the studio etc. These, in an anarchic anti-authoritarian statement, are to be put up on the display walls of the college. The reaction to them by management, as the academic year starts shortly, will perhaps be the completion of the work.